The Invicta Diplodocus set the standard for thirty-two years. 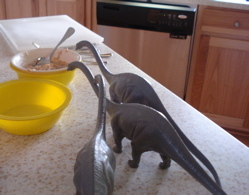 Breakfast is the most important meal of the day for the Invicta Diplodocus. 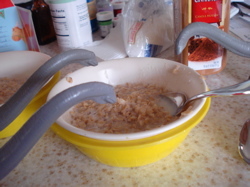 These have chosen Oatmeal and who's to tell them "no"? 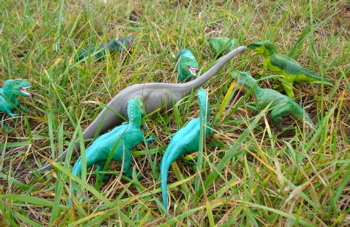 advent of the Carnegie Diplodocus in 2006. 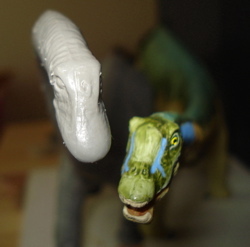 These were molded in a moderately brittle monochrome gray plastic and when Safari, Ltd. launched their colorful Carnegie Collection in 1988-89 Invicta countered by painting their Dinosaurs as well. (above, Picture courtesy of Realm of Rubber Dinosaurs). 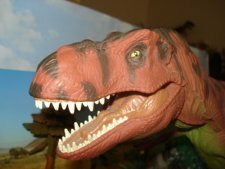 In their time, not all that long ago, these were considered as "museum quality" and certified by the British Museum of Natural History as accurate. Even today they should be considered as quite excellent replicas despite a few glaring errors in accuracy. The biggest error being in the feet. 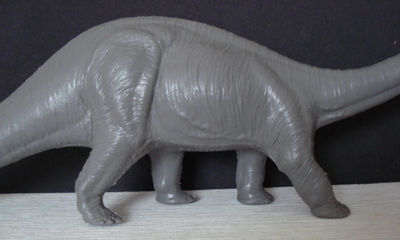 As can be seen on the Carnegie version there is a very large claw on the inside of the front feet. Its use is unknown (although it can be guessed at) and it is missing on the Invicta model (right). The Invicta's tail dragging pose is an even more obvious and glaring inaccuracy. nothing more than watch them go by. 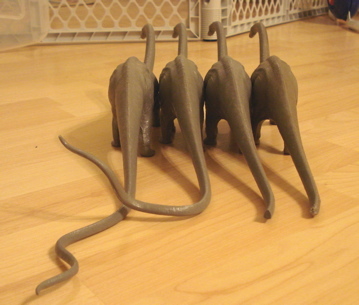 Their tails, which made up half their total length of 115 feet or so (making these 1/63 scale, not the advertised 1/45), were formidable weapons and could break a predators leg when wielded at speed. dangerous walking buffet. Once one had been chosen the rest of the menu would continue on its way unmolested, the herd a little bit stronger despite the loss. As it was is as it will always be. The similarities are glaring. 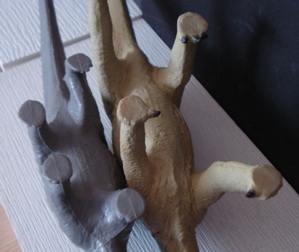 In fact the feet positions are the same as all the sauropod Dinosaur toys that I have seen apart from the newest Carnegie Collection Diplodocus. The detail work on these is superb throughout. You can almost see the muscles rippling beneath the skin as it conforms to the movement of the great beast. The skin folds and forms pockets along the hips, shoulders rib cage and legs as it is compressed and stretched. 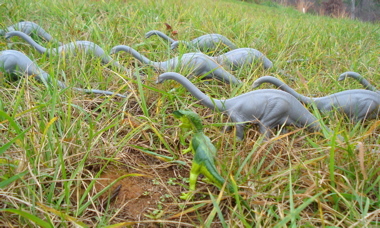 The movement is captured beautifully in this really wonderful, active, non-action figure, Dinosaur toy. Q: Why did the Invicta Diplodocus cross the road? But before we get the answer to that question (bottom of page) there are some others to be answered. 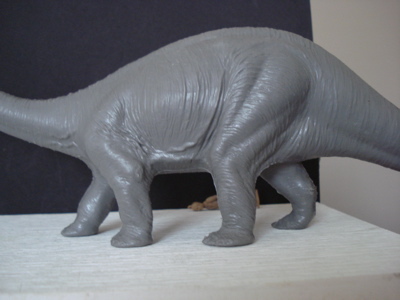 The Invicta Diplodocus, as previously noted, has been out of production for several years, and therefore these are no longer available, new, on the retail market. If you want one, and if you don't have one you should, you will have to find it in the previously owned marketplace. I think that they are heading towards being collectibles as soon as a few more of them get broken. 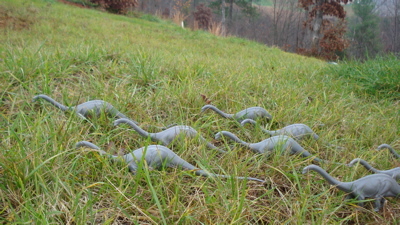 Their tails are particularly prone to the last six inches or so breaking off, right where it begins to narrow down. 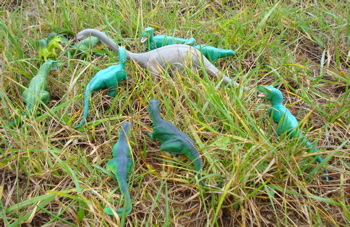 Two of my herd have been so injured. 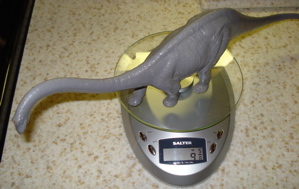 I suspect this has come about as the result of shipping and being stuffed into too short a box as part of the Dinosaur toys slave trade. Another has had its tail bent, at the same general point, at a ninety degree angle to the left. That is actually pretty good looking. 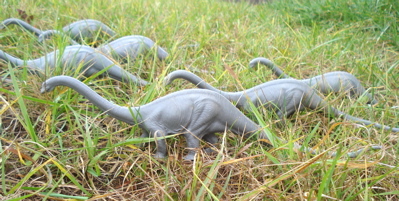 These do seem to be fairly common (moreso than the Invicta Apatosaurus or Mamenchisaurus, for example) and I would say their current base price is around $10.00 and up. I have seen only two on eBay(UK) recently and they ranged in auction price from (USD) $1.66 to $19.92. Either of these prices would be fair. I'd prefer the lower though. In my experience these do not get chewed on as often as, say, the Marx Brontosaurus- possibly their very size intimidates potential predators much as it did one hundred million years (or so) ago. Oh yes. Why did the Invicta Diplodocus cross the road? A: To get away from those guys! !